CRICKET FIELD: There was a public meeting to discuss proposals for the Cricket Field last Saturday (February 2), in the Ahrens Hall. You will be aware that it is proposed to bring the ‘Cricket Field’, behind the houses at the north-west end of the High Street, back into use as a sports field. The development will involve considerable earthworks and extensive drainage works. The Parish Council holds some funds which were part of the proceeds from the sale of the old village hall site, but there is a shortfall of £100,000. The Parish Council is allowed to apply to the Public Works Loan Board for the required amount, spread over a repayment period of up to 50 years. At the current interest rate that is set by the Treasury the amount required equates to a repayment sum of £4,820 per annum or £11.70 per annum for a Band D householder. This is a decision for the village, not the Parish Council, survey forms were available at the meeting and have been distributed to every house in the village, 51% of the responses must be in favour for the loan application to go ahead. 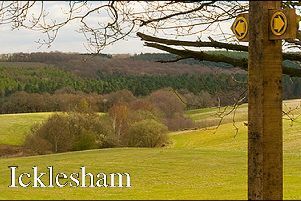 There is one vote for every Etchingham resident who is listed on the Electoral Register for Etchingham, each person needs to submit a separate form, one response form has been delivered to each house, further copies for other members of the household can be obtained from the Parish Office at Parsonage Croft, or can be downloaded from the village website www.etchinghamvillage.co.uk If you require more information before making your decision there is information and some Q & A’s from the Public Meeting on the website, or you can contact the Parish Clerk Monday, Wednesday or Friday 10.30am to 2.30pm at the Parish Office 01580 819048 paulette.etchinghampc@gmail.com . All response forms must be returned to the parish office by Friday February 15. CHURCH SERVICES: Church Services for February and March, all Sunday services are at 11am, this Sunday February 10, Reverend Sally Epps; .February 17, to be confirmed; February 24, Reverend Iain Morrison; March 3, Canon Patrick Sales; March 10, (Family Service) Reverend Sally Epps; March 17, Reverend Christopher Channer; March 24, Reverend Iain Morrison; March 31, (Mothering Sunday) Reverend Sally Epps.